Wish you all a very Happy Diwali! Hope you all are having a good time. This year's festival of lights is kinda special for us, its our baby's first Diwali. I could not spend much time cooking Diwali sweets or snacks, but I managed to make a few. One of them is Atte ka Laddoo, which we Konkanis call as Churmundo or Gava Pita Ladoo. Crush cardamom seeds in a mortar pestle to a fine powder. Heat 1/4 cup ghee in a kadhai or a pan. Fry cashew halves until slightly brown. Set it aside. If not cashews, you can use golden raisins or any other dry fruits of your choice. In the same pan, add wheat flour. Stir well and roast the wheat flour until it turns aromatic and color slightly darkens. This is the key step in making Atte ka Ladoo. You don't want that raw smell of flour. In a big mixing plate, add roasted wheat flour, powdered sugar and cardamom powder. Mix all the ingredients well with a spoon. Taste it for sugar and add more sugar if required. Add the remaining 2 tbsp ghee to the plate. Grease your hands with ghee and mix well. Divide the laddoo mix it into 8 parts. Roll each one between your palms into a round ball. Press a cashew piece in the center of each one. 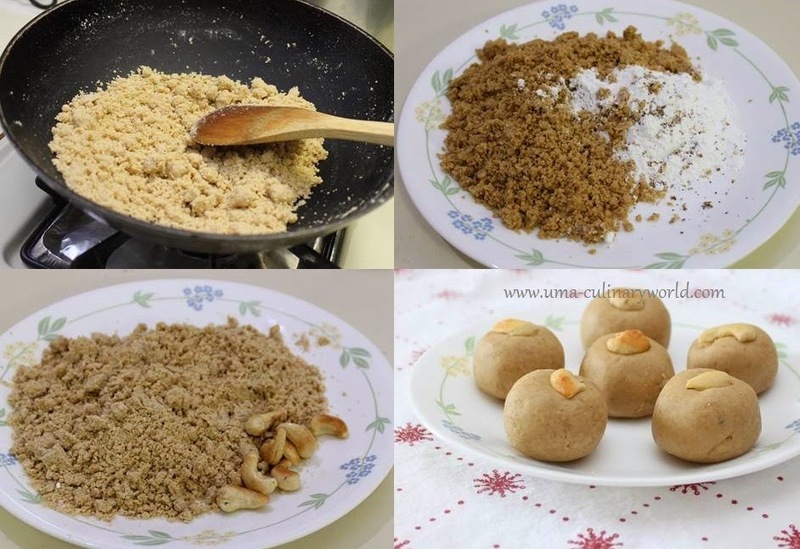 Your Wheat Flour Ladoo are ready to enjoy. looks cool :) very neat!